The Tip Tap Overlap: Brain Teaser meets Tic Tac Toe! iPhone, iPod Touch, and iPad game takes tic tac toe boards to a new level with this challenging and thoughtfully crafted puzzler. You must manipulate four tic tac toe boards with an X, O, or multiple X’s and O’s with gesture controls to match the gold tic tac toe puzzle. This free iTunes App Store download provides access to 350 puzzles to tap and drag your way to success. 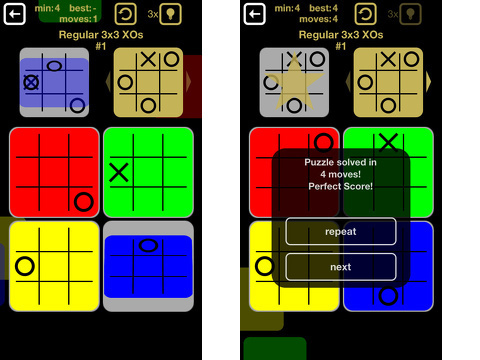 The home screen has six tic tac toe boards – or grids – with different colors and functions. The gold grid in the upper right corner is the puzzle that must be created. The four primary-colored grids in the bottom of the screen are those that must be moved with your fingers to achieve the gold one. The silver grid in the upper left corner shows a combination of all four primary-colored puzzles. With each change to the primary-colored puzzles, the silver puzzle shows the transitions. The silver grid is an unexpected touch. It becomes your friend and your foe, as the game unfolds. When you are on the right track, it is a huge help. When you hit a wall and muddy your puzzles, it just an unfortunate reminder of the mess you have created. In that case, a touch on the redo icon is your best choice. The gesture controls are introduced in pop-ups. You drag the grid to move it one turn clockwise or counter-clockwise. You use an extended drag to turn the grid multiple times, but that lengthy drag will only result in one move added to your problem-solving process. A tap flips the grid. You can flip it horizontally or vertically, and the grid flips toward the area where you tap. You want to complete the gold puzzle in as few moves as possible. In the beginning, the grids are 3 X 3, and each tends to have only one X or Y – or two at the most. The order of your gestures to find success is not a huge issue. As you progress, more X’s and O’s are added, and you must adjust your strategy. A grid may require multiple gestures and appropriate timing of movements to solve a puzzle. It is a challenge to keep an eye on four puzzles to manipulate, the in-progress grid, and the gold puzzle. As you move into 4 X 4 and 5 X 5 grids, the gold puzzle can feel elusive. If you need help, you will find the hint interface intriguing. They are F’s upside down and sideways that are shaded in grey on the grids. You then use gesture controls to move the F’s to their correct orientation. The Tip Tap Overlap iPhone app is free, but in-app purchases are available. Hints are sold in packages of 5 for $.99 and 15 for $1.99. 150 extra puzzles are available for $.99. The Tip Tap Overlap: Brain Teaser meets Tic Tac Toe! iPhone, iPod Touch, and iPad app is well-executed, challenging, and an exciting approach to a puzzler. 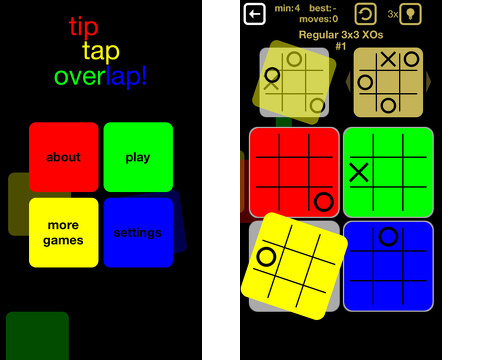 AppSafari review of Tip Tap Overlap: Brain Teaser meets Tic Tac Toe! was written by Jenni Ward on November 11th, 2013 and categorized under App Store, Free, Fun, Games, iPad apps, Puzzler, Strategy, Universal. Page viewed 4014 times, 4 so far today. Need help on using these apps? Please read the Help Page.